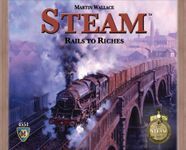 "Steam: Rails to Riches" (not "Steam") edition. Condition: Used. Bought new, punched but never played. Box shows some shelf wear and has a light but long scratch on the front (received like this from the store).